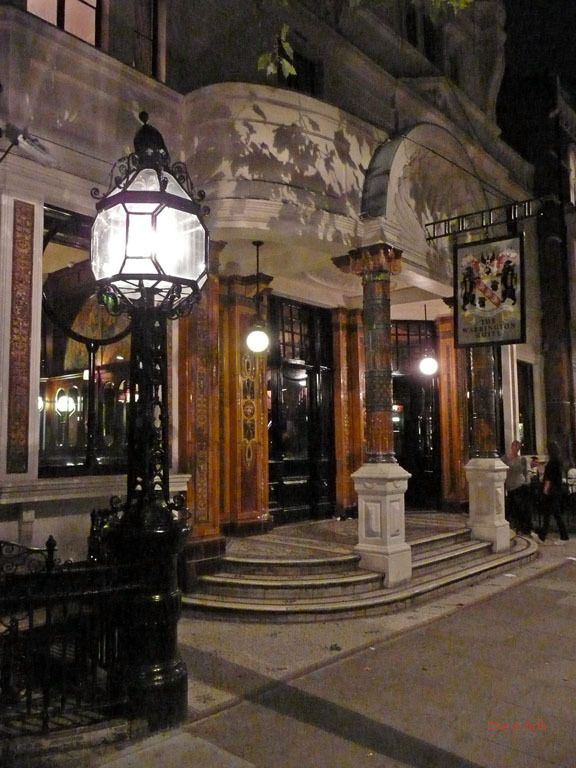 The Warrington is an art nouveau masterpiece. The impression starts at the front porch which is topped by a large plaster shell, flanked by two elaborate lamps on metal posts, and supported by two columns covered in heavily embossed and colored ceramic tile. The same tile covers the porch walls around the dark wood and glass doors. 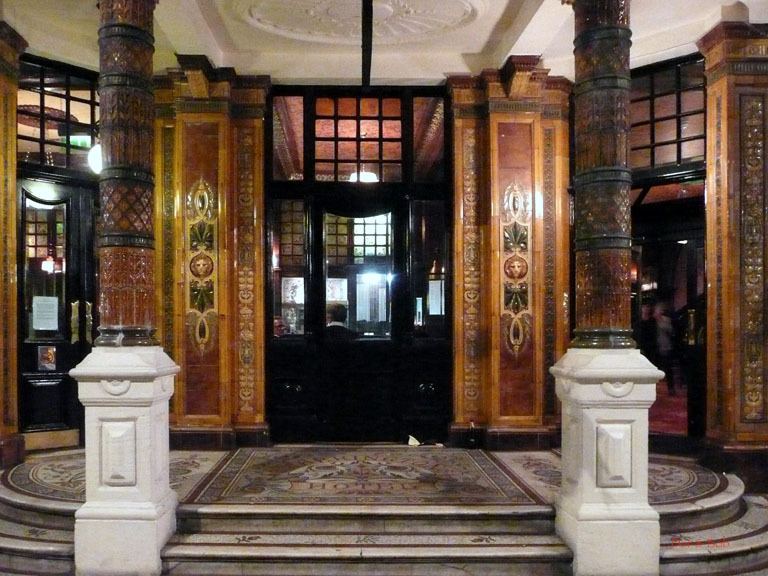 Then you step inside and see an almost circular intricately carved wooden bar with a marble top. It runs through both sides of the pub. The bar back has detailed designs in both frosted glass and mirrors and is topped by two-tone drawings of swaying women. 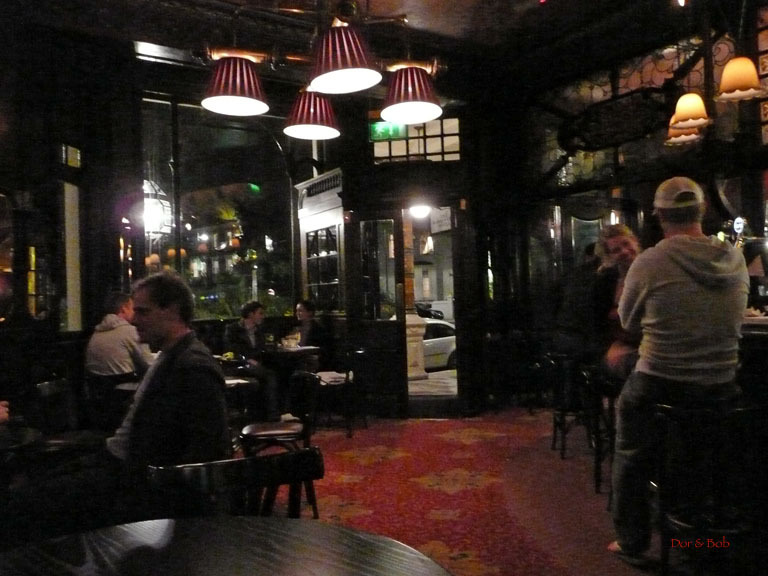 Decorating the pub throughout are art nouveau stained glass and tall narrow oval mirrors. Complex carved wooden arches connect the marble (real or painted?) columns that run along the walls. The ceiling itself is tall and painted in an italianate/William Morris style in dark red, orange and green. A marble fireplace has two tufted dark green couches on each side. The woodwork on the large windows in front is in a simple but lovely flowing open style. It should be a required stop just to see this pub, let alone try the beer. The atmosphere is true pub and the beer selection is respectable with 4 real ales to choose from. On our visit: Tribute, Fullerâ€™s London Pride, Deuchars IPA, and Adnams Broadside.